Fabulously illustrated comic style adventure explaining food allergies and anaphylaxis for children. It’s Paulina’s birthday and everyone is excited about the classroom party she is having – cupcakes galore! Paulina then suddenly feels ill. The whole classroom disrupts into chaos – poisoned cupcakes! But no, Paulina is allergic to peanuts and she’s unfortunately eaten the wrong cake. Enter the Medikidz – a dedicated group of superheroes – who whisk Paulina and her friend away before her classmates can say “call poison control!” Pump, Skinderella, Chi, Gastro, Axon, and the trusty brain-on-legs, Abacus, are specialist tour guides of the human body and can tell Paulina all about her food allergy and anaphylaxis. Join Paulina on her journey around Mediland (a planet shaped just like the human body) as she discovers the facts behind her food allergy and anaphylaxis. Along the way they will encounter the confused immune system army, gruesome infections and the Medikidz’ arch nemesis, Anna Phylaxis. Will the Medikidz be able to avoid Anna’s attacks and deliver Paulina back to earth in time to finish off her party? 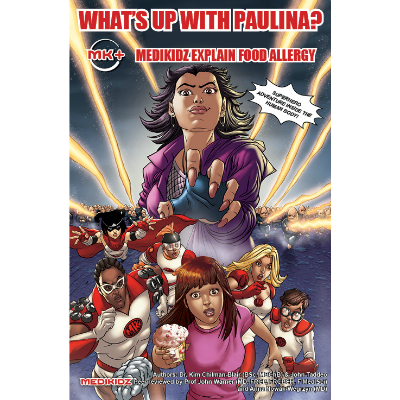 A great way to explain food allergy and anaphylaxis to kids and teens in a format they love. Written by doctors for children.